I'm showing some work along with 20 + Brooklyn artists--Come through this Saturday! Check out the preview of some of the other exhibitors' work on my personal blog. 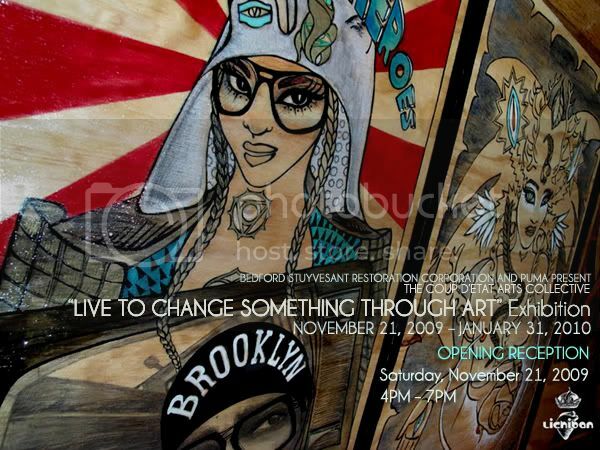 (BROOKLYN, NY) November 12, 2009 – Bedford Stuyvesant Restoration Corporation’s Center for Arts and Culture, PUMA, and The Coup d’etat Arts Collective are honored to announce the opening of “Live to Change Something Through Art,” a mixed media exhibition of works created by 23 local artists. Please join the artists for the opening reception on Saturday, November 21, 2009, from 4 p.m.– 7 p.m. at the Bedford Stuyvesant Restoration Corporation’s Skylight Gallery, 1368 Fulton Street, 3rd Floor, Brooklyn, New York. “Live to Change Something Through Art” features work that is reflective of the current Brooklyn arts movement and underscores Coup d’etat’s thought-provoking brand principle, “Live to Change Something.” Highlighting a multicultural collective of artists across several disciplines, the exhibition encompasses painting, photography, sculpture, video and installation. Artists that were hand-selected to participate in “Live to Change Something Through Art” include: Molaundo Jones, Suhail Smith, Sam Wilson, Lichiban, Rob Fokused, Alice Mizrachi, Stephanie Land, Deka, SeeOne, One9, Alzo Slade, Ana Bravo, Berman Fenelus, Jen One, Reuben King, Amanda Diva, Nelson Rivas, Kwesi Abbensetts, Paul Deo, Robert Trujillo, Suncadm Bey, Ibrahim, and Yang-Chi. For nearly four decades, Bedford Stuyvesant Restoration Corporation has served as a fertile ground for emerging and established artists throughout Central Brooklyn. Through its Center for Arts and Culture, Restoration continues to present, promote, and preserve the artistic legacy of artists from the African Diaspora.